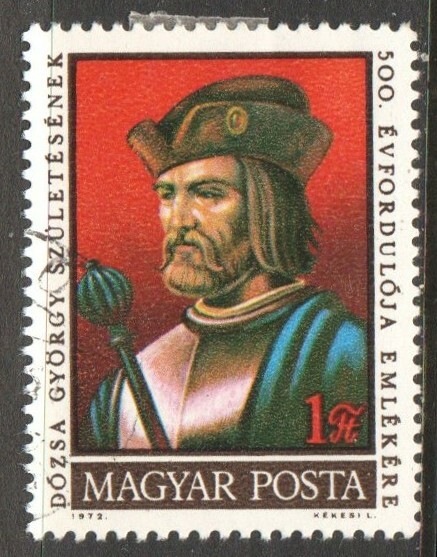 György Dózsa was a Székely man-at-arms from Transylvania who led a peasants uprising against the Kingdom of Hungary's Nobility in the 1500s. 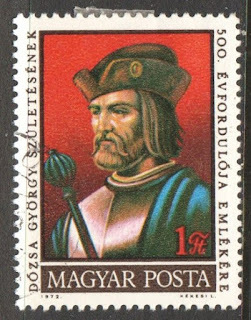 He was born in 1470 during the Hungary's war with the Ottoman Empire and grew up to become a soldier of fortune who was well known for his valour. In 1514, under the direction of the Hungarian Chancellor, Dózsa was asked to put together an army to fight the Ottomans. He raised an army of 40,000 mostly peasants, students, priests and friars. At the conclusion of the training his army started complaining about their status and the treatment they were receiving at the hands of the nobility. As a result the nobility started to treat their families poorly and placed retainers on their return to reap the crops that were due to be harvested. This combined with the nobilities lack of military leadership led to to Dózsa's army to lead a war of revenge against the nobility. Dózsa was successful and on all accounts seemed to operate honourably and with the exception of those nobles who were extremely greedy he rarely tried to execute those he captured. His primary concern was his lack of control over his followers. His successes were becoming a bigger problem for the King and his capture was a necessity. This was accomplished at Temesvár. After his capture Dózsa was tortured and killed.